Swiftkey announced this morning that themes in their Android and iOS keyboards are now all free. What does that mean for you? Only unlimited (over 100, in reality) theming madness, so themey your themes will be fighting with other themes over themes that those themes didn’t know were so themed. Themes, people. That’s really all the news I have to share. You can access themes by sliding out the hamburger menu from within the keyboard and choosing “Themes” and “Swiftkey Store.” That’s it. Have fun with the themes. 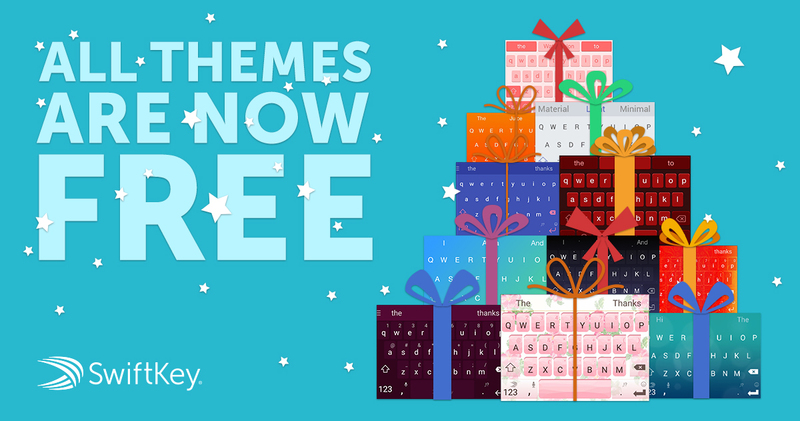 With the holiday season upon us, we wanted to spread a little SwiftKey cheer of our own – so today, we’re excited to tell you that all themes on SwiftKey Keyboard for Android and iOS are now completely free! If you’re on Android, simply tap or slide the hamburger icon on the prediction to enter the SwiftKey Hub. From there, open the ‘Themes’ panel and select ‘SwiftKey Store’. For full instructions on how to get there, check out our How-To article. There, you’ll find over 100 themes to customize your SwiftKey Keyboard’s color and design – as well as brand new ‘Vivid’ themes which are, of course, also free. These new Vivid themes follow the launch of a redesigned SwiftKey Hubdce- complete with new user-requested feature, like text expansion shortcuts. If you’re on iOS, simply open the container app from your homescreen and click the red ‘Design’ icon in the top right to pick from these newly free themes. We’d love to hear what you think about the new themes – let us know which ones you’ve snapped up on Twitter! And thank you again for all of your support along the way.